Last week’s post was pretty serious so I want to break things up a bit with some more family vacation pictures. They make me happy. We decided to take a day trip to Eger (pronounced egg-air), Hungary. It was hard to choose one day trip. There were so many places I wanted to see, including the town where my great-grandmother is buried, but it was too hard to get to. And there was a lot to see and do in Eger. It seemed like the right choice. And we were so lucky because the day they were there, all of the locals were dressed in period costume and having archery contests. Eger is famous for it’s castle, thermal baths and it’s wine, especially Bull’s Blood, a full bodied red wine (so good!!!). Here are some pics from our day. This is the main train station in Budapest. Oliver loved how you could see the tracks and the trains as soon as you walked in. And look at that ceiling! The train had huge windows to look out of. Along the trip, these beautiful yellow flowers were blossoming as far as the eye could see. Just a sweet picture of my guys. Oliver snapped this of me while I was looking out of the window. I kind of love it. Once we arrived, we took a short cab ride into the town. We were starving so the first thing we did was find some lunch. It was so yummy!!! Strawberry soup. It’s a cold soup made with strawberries and sour cream. My grandma used to make a version with cherries. It’s a soup but it’s like a dessert. It’s basically the best thing ever. I had schnitzel on this trip more than I care to admit. I love schnitzel!!! Depiction of the Turks invading Eger in 1552. The Hungarians held them off in a 38 day battle. Locals dressed in period costume and engaging in archery contests throughout the town. View of Eger from the castle walls. Doesn’t Eger look like a storybook village? The beautiful, quaint streets of Eger. We let Oliver take control of the camera several times on this vacation and we found that his pictures were some of our favorites. Here is Eger from Oliver’s perspective. That’s Eger! Going there made me want to explore all of the small towns of Hungary but, alas, we were soon heading off to our next destination, Vienna. The final part of our journey to come next week. Categories: Uncategorized | Tags: breast cancer, Eger, Eger Castle, family travel, family vacation, Hungary | Permalink. Here is part two of our family trip to Budapest and Vienna. Lamb paprikas with bacon wrapped cheese noodles. At Ghetto Goulash. Next week, our day trip to Eger, Hungary. Categories: Uncategorized | Tags: budapest, Chain Bridge, City Park, family travel, family vacation, Ghetto Goulash, Hungary, Vajdahunyad Castle | Permalink. It’s been a month since we got back from our first overseas trip as a family. Budapest and Vienna were amazing!!! So spectacular. I fell in love with it as our plane was descending and I could see the Hungarian farmland stretching for miles. I wondered, are any of the things I am seeing the same things my grandmother or grandfather saw at one time in their lives? Could any of these people be extended family or descendants of neighbors that survived the war? My connection to this land was immediate. I remember my grandmother telling me about the beauty of Budapest. She was spot on. The architecture was unbelievable and the modern mixed with the historic was a visual overload for me. We are so lucky that we were able to take this trip. If there is any positive to chemo killing my fertility, it’s that we can afford a (inexpensive) plane ride for three. I was proud to share my heritage with my husband and son and I’m so excited to share my pictures with all of you. In all, I took about 4000 pictures on our trip. Only a few hours after landing, Oliver exclaimed, “Mom, how many pictures are you going to take?” I know, crazy right? Here are some to start you off. **Disclaimer: I wouldn’t blame you if you didn’t want to look through all of them. I’m having trouble showing you all my favorites because they are all my favorites! First view of Hungary from the airplane. Our first meal! It was so yummy. Chimney cake, my first of many. Inside Parliament. My picture doesn’t do it justice. Someone wasn’t into the audio tour. Outside Parliament. I could study that architecture for hours. Oliver took this photograph. He ended up taking some amazing pictures on this trip. I made sure to find playgrounds for Oliver each day. Luckily, Budapest had great ones all over the city. Holocaust Memorial. So simple. So powerful. Selfie at the Chain Bridge. View of Pest from the funicular going to Buda. The view from Buda was absolutely breathtaking. Don’t even get me started on the pastries! A Star Wars themed sausage joint in the Jewish Quarter. It seems kitschy but the food was amazing and there was always a huge line out of the door of both locals and tourists. The old mixed with the new on a street in the Jewish Quarter. The weeping willow at the Synagogue. Budapest is getting into the street food scene and Karavan had a lot of interesting choices. The Budapest tasting at New York Cafe. New York Cafe. Back in the day you could buy a cup of coffee and sit there all day. It was so ornate and wonderful. About 350 stairs to get to the top of the Basilica. The Budapest Eye. It was a beautiful ride. We found a model train museum. If you go to Budapest with a child (or not), Miniversum is wonderful. We all had a great time. The Opera House was so beautiful. Unfortunately, we missed the tour by 5 minutes so we only got to see the entrance. It’s supposed to be wonderful. Categories: Uncategorized | Tags: Buda, budapest, Budapest Eye, chimney cake, family travel, family vacation, Heroes Square, Hungary, Karavan, Miniversum, New York Cafe, pastries, Pest, travel | Permalink. Hey, Littlebs, Where Have Ya Been? Hello everyone? Did you miss me the way I missed you? It’s been a few weeks since my last blog post. I’ve had a really exciting few weeks. First, I took a week long class in interview based/documentary theatre. It was amazing. But more on that in my next blog post (exciting stuff!!!!). Then me, Ken and Oliver took a trip to the midwest. We wanted to visit Ken’s sister who now lives with her wife in Madison, Wisconsin so we decided to make a vacation out of it. We flew into Chicago, spent two days there, then rented a car and drove to Door County, WI, and ended in Madison. There were so many highlights I want to share. Again, there will be a multitude of Oliver pictures. We did so much during this vacation and I feel like I need a vacation from my vacation. But I always feel that way. There’s always so much I want to do and I never want to miss out. So, here is our trip from beginning to end. You can click on each image to see what we did! Oliver found a railroad crossing right away. The Crown Fountain was amazing! The Chicago skyline from a beautiful garden behind the Art Institute. I didn’t know Lake Michigan was so blue! Getting sprayed at Buckingham Fountain. Studying the fish at the Aquarium. On day 1, Ken and I also went to the most amazing restaurant, Alinea. It’s one of the top restaurants in the world and Ken has been wanting to go for as long as I can remember. You can watch a documentary about this chef of Chef’s Table on Netflix. He’s a genius. Here, we are eating a balloon made out of strawberry taffy, filled with helium. You can eat the string too!!! Mural outside the 606 in Logan Square. Stump mural in Logan Square. More murals in Logan Square. Centennial Wheel at Navy Pier. Family shot at the top of the Centennial Wheel. Getting soaked in the fountain at Navy Pier. Day 3 was a travel day to Door County, WI but because we had a car rental mishap, we lost the day. But thankfully, we got there safely in the end. Day 4: Door County, WI – Rainy Day, Lighthouse Exploring, Rough Lake Beaches. On a cliff overlooking Green Bay. The storm brought in freezing cold water! There is a strong Scandinavian influence here. Look what the wind was doing to my hair!!!! A beautiful sunset at the end of the day. Violent waves crashing on the cliffs at Cave Point on the Lake Michigan side. In the freezing cold but beautifully clear water of Lake Michigan. Rock formations built on a beach at Lake Michigan. Oliver is building his own tower. Spoiler alert! It falls down and he cries. This is not a tropical island! It’s Lake Michigan! Holy Moly! Photo taken by 3 1/2 year old Oliver. Cheese tasting!!!! Getting in a little play by the beach. One of my favorite pictures of me ever. Taken by Oliver. On Day 6, we traveled to Madison. On the way we stopped for a cheese tasting and at night, with Ken’s sister, we went to a Friday Fish Fry and I tasted my first fried cheese curds. Nomnomnom!!!! There were many railroad crossings in Madison. Oliver made us stop at every one! Yummy vegetables make a plant based diet easy. I wish I could have brought these flowers home. Oliver and his Auntie Foo in the human hamster wheel. Singing “Let It Go” with Auntie Foo. View from my run in the arboretum, my only run of the vacation. Lucky guy gets a muffin and yogurt parfait for brunch. It’s good to be 3 1/2. Cow. Because, like, in Wisconsin, they make cheese!!! Photo by Oliver of Ken. In a gift shop, they had books about NY and Brooklyn! Day 9: Madison, WI – Last Day. I didn’t take too many pictures this day. We mostly explored again but we got super tired and stayed low key. We went to a cheese curd festival and they had baby farm animals. Here, Oliver is teasing this lamb with day glow orange cheese popcorn. Crazy ice cream place. This picture doesn’t do it justice. Look, mom! I’m on the tracks! So, this is what I’ve been up to. If you actually looked at all of these pictures, you are my hero. Happy Labor Day, everyone!!! Can you believe summer is over? Categories: Uncategorized | Tags: breast cancer, Chicago, Door County, family vacation, vacation, Wisconsin | Permalink. When I go on vacation, I take thousands of pictures. I can’t help it. I love looking at the world through the camera and I’m afraid that if I don’t document every moment, I will forget it. This drives my husband crazy. He just wants to keep moving and exploring. I want to take a picture of that beautiful flower bud with the river in the distance. We differ in that way. But always…always…when push comes to shove, we have amazing memories to look back on. Inevitably, when we look back, we come across a picture and we realize that it shows a moment that we had forgotten. A moment that, without that picture, might be lost forever. The other night I was looking at our first and last vacation as a family, just Ken, Oliver and I. We went to Oregon. I had always wanted to visit the Pacific Northwest and we decided that this would be the perfect first trip to take with a toddler. There’d be lots to see and do, great food to eat, wine tasting, hiking, culture, ocean…everything. And this vacation delivered. It was June of 2014. Oliver was 18 months old. It fell on our 6th anniversary. But after it ended, one week later is when I found my lump and our lives changed forever. I haven’t looked at these pictures in a very long time. It feels like a lie. A fraud. Looking at our smiling faces…we were ignorant of what was coming. Of what was already growing inside of me. I look at those pictures and I know what in the next chapter. I see those pictures and I’m scared for the people in them, as if it wasn’t me or my family. They are another family. It’s going to happen to someone else. I cry for them because they don’t know what’s about to hit them. I think about my cancer then…laughing…mocking me…like a thief hiding in your closet only to come out when you’re not looking to take everything that’s precious to you and turn your home upside down. Cancer stole so much from us. It turned our lives upside down. But when I look at those pictures, all I see are those unknowing, unsuspecting people. And I just want to scream at them to beware of what’s lurking. I now think about my life consisting of two parts; before breast cancer (BBC) and after breast cancer (ABC). 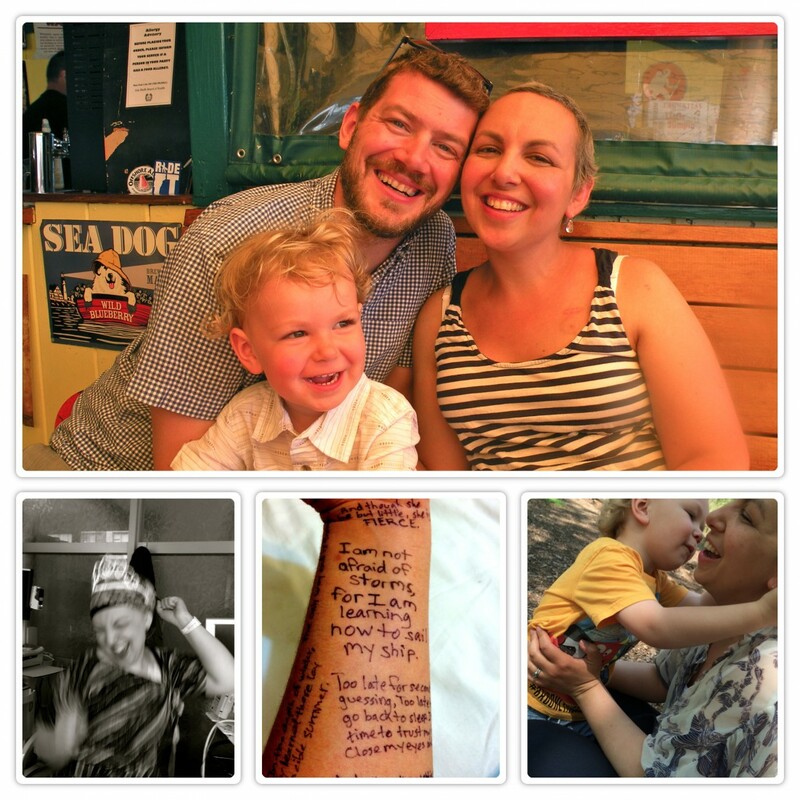 I often look back to the time before breast cancer and long for what I had. It wasn’t perfect. Is anything ever perfect? But we were happy. We were traveling, which was a goal of mine for Oliver. I was satisfied with my career and beginning to think of the next steps. I started thinking about the possibility of having another child even though I had said, “one and done.” My life was developing and moving forward. These pictures remind me of that. It breaks my heart. After breast cancer is much different. I have trouble seeing the future in the way I used to. I don’t know what my life is supposed to look like now. I don’t know what I want to do or where I want to go. What are my goals? What are the next steps in my life? It’s like cancer is the glue that sticks me to this past year and half and won’t let me move forward. And these photos, however beautiful, however memorable, remind me of that. Do you view your life in two parts; before breast cancer and after breast cancer? Categories: Uncategorized | Tags: after breast cancer, before breast cancer, breast cancer, family vacation, future, looking back, memories, past, present | Permalink.